Don’t miss the opportunity to take part in these workshops and forums with Daniel Fisher in Sydney (10-14 July 2017) and Melbourne (17-21 July 2017). 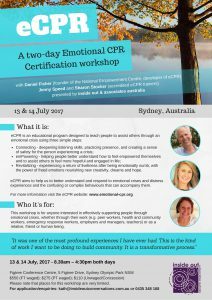 Daniel will be presenting a two-day emotional-CPR workshop. eCPR is a program which is designed to help us better understand and respond to emotional crises and distress experiences and the confusing or complex feelings and behaviours that can accompany them. This internationally recognised approach focusses on connection, empowerment and revitalisation as the three crucial steps to assisting others through emotional crisis. 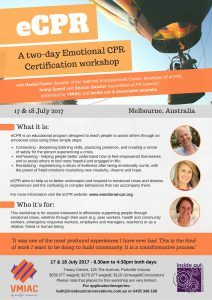 eCPR workshop will be held in Sydney on 13 & 14 July 2017 and Melbourne on 17 & 18 July 2017. These workshops are almost full so book now to avoid disappointment! For more information, click on the relevant link below. This one-day forum explores the relationship between personal meaning and recovery, and how we can navigate the differences in personal realities to create a pathway to shared understandings and more creative, hopeful and helpful responses to mental distress. Daniel will be joined by other well-known and well-respected speakers who will provide important perspectives on this topic. 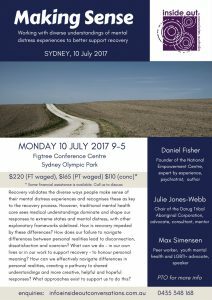 In Sydney (10 July 2017), Daniel will be joined by Julie Jones-Webb and Max Simensen. 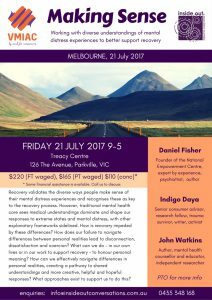 In Melbourne (21 July 2017), Daniel will be joined by Indigo Daya and John Watkins – more details, bios and program coming soon! Click on the links below for a flyer and registration form.